Over a thousand Ghanaian celebrities and lovers of the Arts and Entertainment Industry thronged the Accra International Conference Centre last night, Saturday March 21st 2015, to witness the maiden edition of the GN Banks Awards. As promised by the event organizers, Spyder Lee Entertainment, it was one of the biggest nights on the Ghanaian entertainment calendar accompanied by the glitz and glamour associated with first rate events around the world. On the night, multi-talented Ghanaian broadcaster, Nathaniel Kwabena Anokye Adisi (Bola Ray) was announced as the winner of the ultimate award, The Favorite Celebrity 2015. He also won in the Male Radio Personality category. Other winners on the night included Shatta Wale, Juliet Ibrahim, Gifty Osei, Halifax Ansah Addo, James Gardiner, Nana Yaa Brefo, Asamoah Gyan, Kojo Frempong, Akumaa Mama Zimbi and Vibrant Faya. Life Time Achievement Award recipient was David Kotei Poison, the first Ghanaian to win a world boxing title whilst MTN Ghana received the GN Bank Corporate Award. The GN Bank Corporate Award is to recognize entities who have contributed tremendously to the development of the Arts & Entertainment Industry over the years. On hand to entertain the patrons were award winning songstresses Efya and Raquel and both gave a fantastic show! The renowned Ghanaian highlife musician Abrentia Amakye Dede thrilled the audience back to back with his hit songs whilst the Dancehall King, Shatta Wale, got the crowd jumping to his outstanding live band performance. Other acts on the night, Wiyaala, Obaapa Christy and Joyce Blessing gave a good account of themselves. 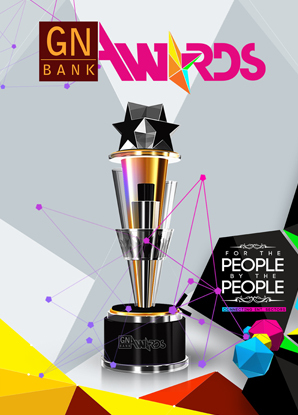 Without a doubt, the GN Bank Awards, which seeks to celebrate and award people within the Arts & Entertainment Industry who have contributed to the industry on a yearly basis, has come to stay! Considering the splendid production and near perfect coordination on the night, patrons are assured of a magical event when the scheme is rolled next year!